Anti-choice activists are now secretly buying up abortion clinics. 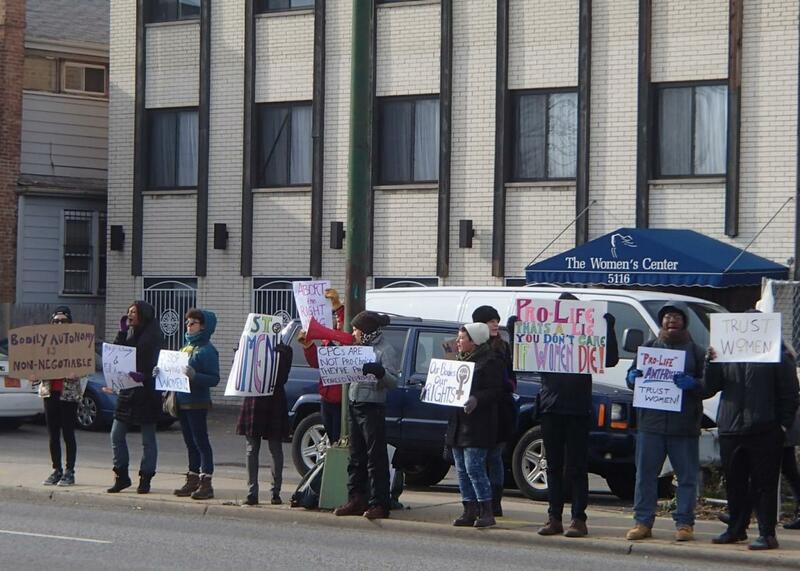 A 2014 protest at a Chicago crisis pregnancy center. Crisis pregnancy centers, which cloak anti-abortion propaganda in the trappings of medical legitimacy, are built on bait-and-switch—they lure women seeking abortions through their doors only to try changing their minds. One center in northern Virginia has taken that foundation of deception to a whole new level. The Washington Post reports that the owner of a Manassas, Virginia CPC, called AAA Women for Choice, got backing from an Indiana-based religious group to purchase the abortion clinic next door, called Amethyst Health Center for Women. The two operated in the same building for decades, with AAA Women for Choice taking in many women who were actually looking for the Amethyst clinic. Last year, Amethyst’s owner and abortion provider retired, closing the clinic. Pat Lohman, the proprietor of AAA Women for Choice, got the backing of the Blessed Virgin Mary Foundation, which bought Amethyst as a “group of medical office investors.” Immediately after the sale went through, calls to Amethyst’s phone number began redirecting to AAA’s office. The Post reports that representatives from NARAL Pro-Choice Virginia called AAA and asked for Amethyst, and were told that the CPC was “taking calls” for the now-closed abortion clinic. Amethyst’s office is shuttered, but women who see some of the clinic’s remaining ads and show up for abortion care will find a door labeled with “choice” just a few feet away. This is cheap trickery at its worst—and, NARAL believes, an unprecedented ploy—but it’s very much in line with entire premise of CPCs. The reason many anti-choice proponents believe CPCs are an effective barrier to abortion access is precisely because of the lies they tell women. A 2006 congressional investigation reported that CPCs routinely provide women with false information, including claims that abortion causes breast cancer, sterility, and suicide. NARAL Pro-Choice California sent investigators who weren’t pregnant to dozens of the state’s CPCs; none were told to seek medical attention after ultrasounds showed no fetus, and one CPC employee told an investigator that the intrauterine device that showed up in her ultrasound was her “baby.” When an 11-year-old girl visited AAA Women for Choice with her parents, who thought she was pregnant (she wasn’t), the CPC didn’t report the incident to the police, even though it could point to sexual abuse. “Oh no, we don’t [report potential abuse]. We’re not doctors, so we don’t have to,” Lohman told the Post. Because it can’t make the case against abortion on its own rational merits, the anti-choice movement relies on misinformation and subterfuge to achieve its goals. The con artists who tried to topple Planned Parenthood with last year’s series of undercover videos stole identities, made fake IDs, and incorporated fake businesses to get footage that still didn’t prove any wrongdoing. They were indicted on felony charges for their deception. CPC proprietors may be harder to prosecute, but their lies are just as shameful.